JAKARTA, Indonesia -- South Korea won its second straight women’s volleyball match in its Asian Games title defense Tuesday. South Korea defeated Kazakhstan 3-1 (25-9, 25-15, 28-30, 25-20) at GBK Volleyball Indoor, improving to 2-0 in Pool B play. South Korea will next face world No. 1 China on Thursday at the same venue. There are six nations in Pool B and five in Pool A. The top four from each will advance to the quarterfinals. South Korea is expected to ease into the quarters, and it’ll likely run into China or Japan, both regional powers, at some point in the knockout stage. World No. 10 South Korea had more than it bargained for against the 21st-ranked Kazakhstan. South Korea took the first two sets over Kazakhstan with ease, but the third set was more of a seesaw affair. Kazakhstan led 16-13 after scoring five straight points, but South Korea fought back as the tight stretch ensued. 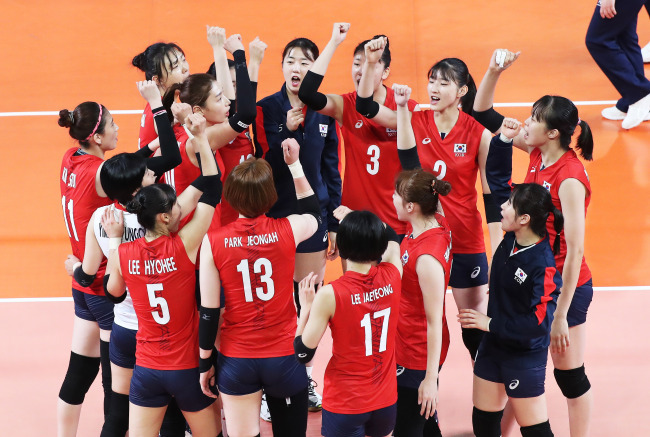 The teams kept trading points until South Korea held match point at 24-23. But Kazakhstan responded with two straight points. South Korea survived the first set point, but at 28-28, Kazakhstan won two straight points to take the set with successful spikes by Natalya Akilova and Yana Petrenko. In the fourth set, South Korea turned a 4-2 deficit into an 11-5 lead in a hurry, with Kim Yeon-koung, the team’s top offensive threat who rested in the third set, back on the court.